Whin Rigg sits above the most impressive (and most difficult to cross) of the Wasdale screes, towards the southern end of Wast Water. It isn't quite as tall as its neighbour Illgill Head, but height isn't everything, and the best views down the screes from above actually come from the walk between the two summits. Like so many fells, Whin Rigg has two very different faces. The north-west face is the screes, rocky and dramatic and lined with crags. The south-east face is still steep (although not quite as steep), and is smooth and largely featureless (other than the minor dips cut by Great Grain Gill and a tributary of Little Grain Gill. Whin Rigg has a second dramatic feature that would stand out on many other fells but that is overshadowed by the screes here. Greathall Gill is a straight sided ravine that runs down the steep northern slopes of the fell, cutting almost all the way from top to bottom. 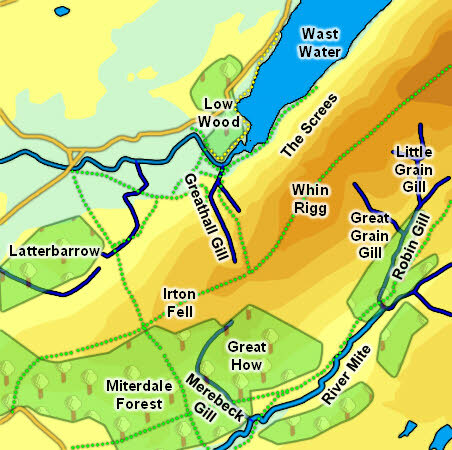 There are three main routes up the fell, of which only one comes directly from a valley bottom. This is the route that comes up the side of Greathall Gill to reach the ridge, then turns left to reach the summit. The second route follows the ridge from Irton Pike and can be reached from the small car park on the road that cuts across the pile. From the east the main route is to continue on from Illgill Head, ideally following the path that runs close to the top of the Wasdale Screes. The Miterdale side of the fell is generally steep and pathless. The best route up here is probably to follow the edge of the forest just above Low Place. This eventually comes to the ridge at about the same place as the Greathall Gill path. The summit sits at the top of a grassy dome, with a scattering of rock across the top. The eastern boundary begins with Little Grain Gill, which rises south of the summit of Illgill Head, then flows south. The flows into Robin Gill, which flows south-west, and then flows into the River Mite, which continues on to the south-west. The western boundary of the fell is less clear-cut, with the ridge continuing to lose altitude almost all the way to Irton Pike. A convenient dividing line runs up Merebeck Gill in the south and Greathall Gill in the north (this really does feel like a boundary, but only really on one side of the fell). Greathall Gill flows into the River Irt just below Wast Water. The lake forms the northern boundary of the fell. Great Grain Gill rises just to the east of the summit and runs south-east into Robin Gill. Whin Rigg has no named tarns, but there are small pools on the summit and slightly larger tarns on the ridge to Illgill Head.